Most people cannot remember when their childhood ended. I, on the other hand, have a crystal-clear memory of that moment. It happened at night in the summer of 1966, when my elementary school headmaster hanged himself. In 1966 Moying, a student at a prestigious language school in Beijing, seems destined for a promising future. Everything changes when student Red Guards begin to orchestrate brutal assaults, violent public humiliations, and forced confessions. After watching her teachers and headmasters beaten in public, Moying flees school for the safety of home, only to witness her beloved grandmother denounced, her home ransacked, her father's precious books flung onto the back of a truck, and Baba himself taken away. From labor camp, Baba entrusts a friend to deliver a reading list of banned books to Moying so that she can continue to learn. Now, with so much of her life at risk, she finds sanctuary in the world of imagination and learning. This inspiring memoir follows Moying Li from age twelve to twenty-two, illuminating a complex, dark time in China's history as it tells the compelling story of one girl's difficult but determined coming-of-age during the Cultural Revolution. Snow Falling in Spring is a 2009 Bank Street - Best Children's Book of the Year. 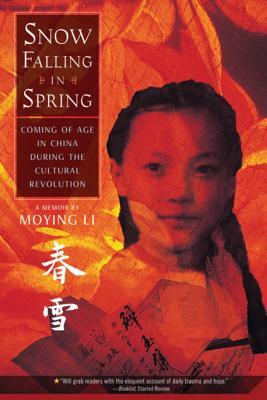 Moying Li grew up in Beijing, China during the tumultuous Cultural Revolution (1966-1976). During that period, Moying was primarily self-taught, following the guided lessons and reading lists her father, who had been a prominent screenwriter, was able to send to her from a "hard labor farm." In 1980, thanks to a generous scholarship and a plane ticket from Swarthmore College, Moying left Beijing where her family still lives, and traveled to the United States to pursue graduate studies, and for the next ten years she immersed herself in what she had always craved, the unrestricted pursuit of knowledge. She is the author of Snow Falling in Spring.